Did Ernie Gruen Recant His ‘Aberrant Practices’ Document - by Craig (CrossWise Blog) Regarding Kansas City Fellowship/Grace Ministries? Regarding Kansas City Fellowship/Grace Ministries? The “critic” White above refers to is obviously Ernie Gruen. These are very strong words although White would later agree that his overall statement was “intemperate.”2 This will be addressed in more detail a bit later. As stated in the first part of this article, the exoneration of Paul Cain by Gruen will be examined in full since this has been used by some to negate the entire Document. Toward this end, we will explore Cain in some detail as well as some of his closest allies of this period including Mike Bickle (International House of Prayer – more commonly “IHOP”), John Wimber and Jack Deere. And since there have been attempts at discrediting the Gruen analysis of the “drought prophecy,” this will be specifically discussed in detail in closing. 6 Beverley, Holy Laughter; p 131 and Jackson, Bill The Quest for the Radical Middle. 1999, Vineyard International Publishers, Ladysmith, Cape Town, South Africa; p 182. Confusingly, at least one subsequent “Re-published” issue has different page numberings. The 2nd issue was Re-published in 2000 as VIP, Cape Town with the same page numbering as the first edition; whereas, the 2010 “Re-published for Amazon” issue (VIP, Cape Town also) has different page numberings. Herein and hereafter, all page numbers will reference the earlier edition followed by the later one, e.g. : p 182 / 175. Neither Beverley nor Jackson provides any specific proof. Is there perhaps an exchange between Cain and Branham recorded or an extant photo which would prove unequivocally? 7 Dager, Albert James “Latter-Day Prophets: The Restoration of Apostles and Prophets and the Kansas City-Vineyard Connection” Media Spotlight. Special Report, August, 1990, Media Spotlight, Redmond, WA; pp 6. Report undated, however verified by Dager. As a contrast, it’s interesting to note that after initially ‘misquoting’ the timing of Cain’s “earthquake prophecy,” Deere later would recall “in vivid detail” the facts concerning that particular “prophecy” yet in a very personal “prophecy” – one that “changed a man’s life” – he adds the detail about his mother “standing on a cliff looking for a jewel” and either doesn’t remember or chooses for some reason not to disclose the fact that demons appeared to him telling him his father was in hell. In fact, the latter appears to conflict with his statement that he would go back and forth in believing his father was either in heaven or in hell. 55 Sullivant, Terry “Paul Cain: Recent Manifestations” p 5 as cited in Dager “Kansas City Connection” p 6 / Vengeance. p 132 / Dager “The Restoration” p 7. Dager records this conference as 1988 rather than 1989 (presumably receiving this from Sullivant) which seems to conflict with the overall chronology as Cain was not introduced to Wimber until December 5, 1988. According to Jackson [Radical Middle. pp 179 / 171-172], Bob Jones purportedly told Bickle that Wimber would call him “in early 1988” opening the door “for future ministry” with Wimber and Vineyard. Purportedly, the call came “five days later” resulting in Wimber and Bickle ministering together in theUK in the fall of 1988. With this in mind, it would seem unlikely that Cain was at an early 1988 conference at Anaheim Vineyard. If this supposition is incorrect, the reader is asked to provide substantiation in order to correct this. Dager clearly illustrates that Cain taught MSoG; however, are the Gruen Document transcripts in error or fabricated? We can safely say, “No.” Existing digitized audio of the “Joel’s Army” tape – yet another one of the tapes on the discontinued list [identified in the Gruen Document as “JAPC”] – prove that the transcripts faithfully represent Cain’s words although a small portion is apparently edited.62 However, this missing section does not affect proving unequivocally that the Gruen Document does in fact show that Paul Cain was teaching MSoG which, as noted, is heresy. Note that Cain states “Revelation 12:25” which is an obvious error as the 12th chapter of Revelation ends with verse 17. In his zeal, Cain misspoke as he meant “Revelation 12:2-5” instead since these are the verses used to denote the “man-child” doctrine. Also, he mistakenly says “bride of the Lamb’s wife” instead of “bride of the Lamb” in all his excitement. 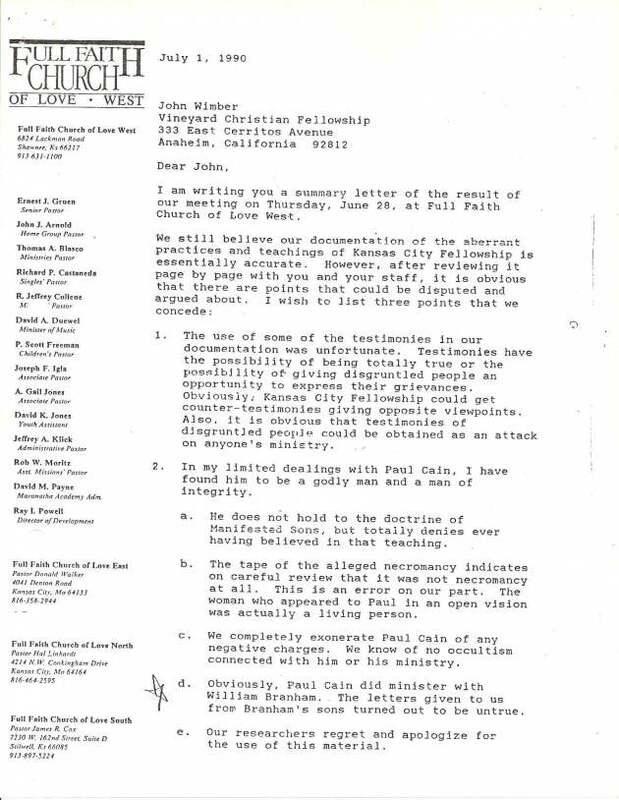 Furthermore, note that the phrase “We completely exonerate Paul Cain of any negative charges” is specifically in conjunction with “We know of no occultism connected with him or his ministry” in sub-point ‘c’ rather than the preface which would have necessarily encompassed all the sub-points: a through ‘e’. Does this mean Gruen only intended the “we completely exonerate…” phrase to be specifically in connection with occultism such that the “negative charges” only pertain to occultism? As it’s written, it seems possible this phrase of exoneration does not apply to sub-points ‘a’, ‘b’, ‘d’ & ‘e’. 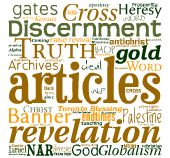 It appears that each sub-point addresses one specific item namely: sub-point ‘a’ – Manifested Sons doctrine; ‘b’ – the alleged necromancy; ‘c’ – occultism; ‘d’ – Cain’s association with Branham; and, ‘e’ – a blanket apology. “…[T]here will be the total withholding of everything for three month, although the Lord will allow a little bit of liberty. … Bob had given a specific date for the end of a drought which he predicted was about to begin. …Bob had given a specific date for rain during the drought which he predicted was about to begin.